Radka Nikolova Karagitlieva was born on December 15th, 1931 in the village of Touria, Kazanluk region. 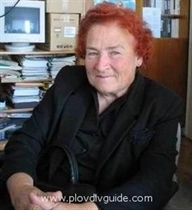 In 1971 she became a member of the “Rossitsa Tchoukanova Embroidery Group” in Plovdiv, that was founded back in 1968. She won numerous prizes and awards from various folklore crafts and arts exhibitions. Traditional Bulgarian embroidery types are divided into 20 different ethnographic regions. The richest ones belong to the Western Bulgarian Region – the Kyustendil, Trun and Samokov areas. The Plovdiv Region does not feature any typical type of embroidery pattern – it is just famous for the “kenne” lace. Radka is a specialist of the kenne lace.